Joists supporting living room floor. 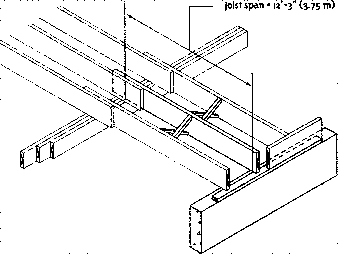 Joist span is 12'-3" ¡3.75 m). Bridging will be installed. Basement ceiling will be not finished. Commercial designation and grade specified is SPF No. 2 or better. Subfloor is 5/8" (15.9 mm) plywood nailed in place. Also note that drywall or gypsum board ceiling finish can be considered a strapping. For this example floor joists can be considered braced with bridging and strapping. 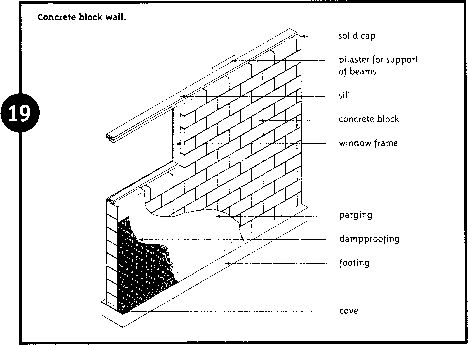 Acceptable floor joist sizes for this application include: 2" x 8" at 12" o.c. (38 x 184mm at 300 mm o.c.) or 2" x 10" at 24" o.c. (38 x 235 mm at 600 mm o.c.). Note that any spacing less than 24" (600 mm) for the 2" x 10" (38 x 235 mm) is acceptable.